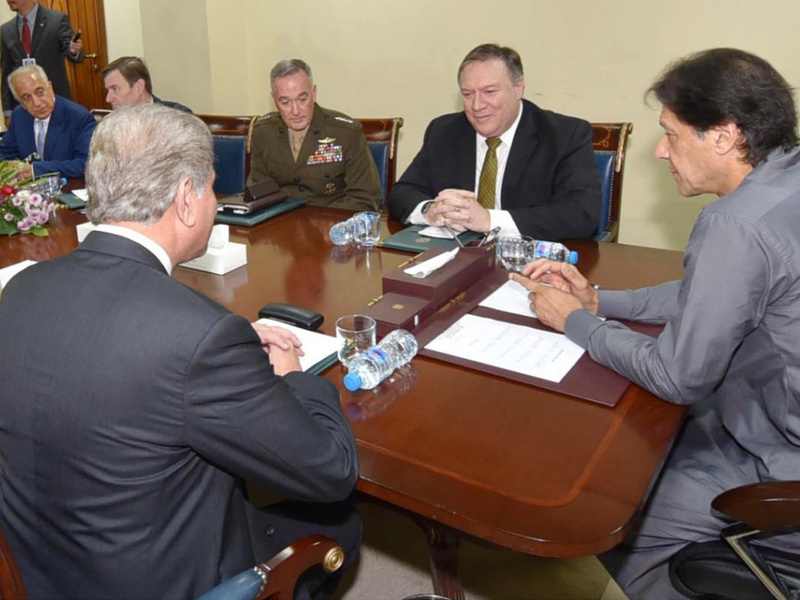 In this photo released by Press Information Department, Pakistan's Prime Minister Imran Khan (right) meets with Secretary of State Mike Pompeo in Islamabad on Wednesday. 2018. Khan said he was "optimistic" he could reset the relationship with Washington after the U.S. suspended aid over the country's alleged failure to combat militants. As he boarded his flight to Pakistan earlier this week, Secretary of State Mike Pompeo explained the purpose of his visit: "New leader there, wanted to get out there at the beginning of his time in an effort to reset the relationship between the two countries." There is plenty to reset. Relations between the U.S. and Pakistan are badly strained. And while it would be unrealistic to expect the two countries to start completely anew overnight, by the end of Pompeo's brief visit on Wednesday, he and Pakistan's new Prime Minister Imran Khan both sounded upbeat. But a true reset requires more than just high-level visits, smiling photo ops and respectful body language. It depends on changes on both sides – symbolic and substantive – and demands coordination among the multiple government agencies involved. As the symbolic gestures began this week, they could have provided an opening for Pakistan's new prime minister to sell the reset to a government and public distrustful of the United States. But the Trump administration undercut its own reset even before it started, by announcing last week its decision to withhold $300 million from Pakistan due to its lack of support for the U.S. South Asia strategy. The United States fell short on the policy front. Shouldn't the hold on funds — a major point of contention between the two countries — have been coordinated with the intended focus of Pompeo's visit to start anew? Instead, the withholding of aid suggests that the U.S. view of Pakistan has in fact not changed, and reinforces the American narrative of Pakistan being an inadequate partner in the war in Afghanistan and fight against terrorism. If anything were to reset the tenor of this bilateral relationship, it would be a definitive statement that the U.S. and Pakistan have found some common ground in Afghanistan — and that is visibly absent at the moment. Pompeo sent a clear message about where U.S. priorities lie when he announced that Zalmay Khalilzad, who accompanied him to Islamabad as part of the reset delegation, had been named as the new U.S. advisor on Afghan reconciliation. The appointment of this former U.S. ambassador to Afghanistan and Iraq, who has been sharply critical of Pakistan's role in Afghanistan, is viewed with caution, if not outright suspicion, by the Pakistani government. So let's be honest — this reset is not about the bilateral relationship at all. It is actually about Afghanistan, the defining feature of U.S.-Pakistan tensions since the onset of the U.S. war in 2001. Reconciling competing interests in Afghanistan will be the ultimate test of a U.S.-Pakistan reset. Let's consider for a moment what would it take to establish a true reset with regard to Afghanistan. The Pakistani government has always looked to Afghanistan's ethnic Pashtuns as natural allies, given their links with Pashtuns in Pakistan's tribal areas. When the Taliban, a predominantly Pashtun Islamic fundamentalist group, emerged in the 1990s in Afghanistan, the Pakistani government threw its support behind the group's rise. Doing so increased prospects of access to transport routes for natural gas and electricity from Central Asia and provided a buffer against Indian influence among other groups in Afghanistan. But Pakistan's connections to the Afghan Taliban now sound a perpetual death knell for Islamabad's relations with Washington. And while Pakistan's relationship with the Afghan Taliban is not as cozy as some American policy makers surmise, there is evidence to suggest that it sought to preserve that strategic link even as it assisted the United States in the Afghanistan war effort. For example, some of the leadership of the Afghan Taliban continue to live freely in the Pakistani city of Quetta, having found refuge there shortly after the U.S. invasion of Afghanistan in October 2001. This "double game," as the Americans like to call it, is precisely the reason for comments like the one President Trump made in January, when he tweeted: "The United States has foolishly given Pakistan more than 33 billion dollars in aid over the last 15 years, and they have given us nothing but lies & deceit, thinking of our leaders as fools. They give safe haven to the terrorists we hunt in Afghanistan, with little help. No more!" For a reset to work, both the machinations of a double game and public discourse about it must cease. Is Pakistan ready to use whatever capital it has with the Afghan Taliban to compel it to consider peace? What does that mean for its relationship with the future government in Afghanistan, especially if the Afghan Taliban are to be part of it? The United States has already started to put its money where its mouth is in cutting off funding, but it must be prepared to change its perceptions and expectations of Pakistani cooperation. It must redefine what it means to "partner" with Pakistan in Afghanistan with regard to bringing the Taliban to the table. With renewed attention to reconciliation talks with the Taliban that started during the Obama administration, the Trump administration seems to be honing its perspective on the central role Pakistan should play in negotiating a political settlement. Pakistan, for its part, will be a willing participant, even more so now as Khan, a Pashtun himself, strongly favors a political settlement with the Afghan Taliban and has even called them "our brothers." But what Pakistan is actually capable of doing remains up for debate. Surely this was the topic of conversation in Islamabad this week and will be what ultimately defines the success of the so-called reset. And therein lies a much larger problem in need of a reset: looking at Pakistan through the prism of Afghanistan. This is a perspective that is not unique to the Trump administration and dates back to the presidency of Jimmy Carter. While this perspective has proven urgent and critical to U.S. national security, it has equally posed obstacles in truly resetting a bilateral relationship that needs reform on multiple levels — from dysfunctional assistance dynamics to nuclear weapons proliferation. Furthermore, the overwhelming focus on Afghanistan prevents the United States and Pakistan from addressing the more nuanced fissures in trust and confidence that have resulted since the attacks of Sept. 11, 2001. Now that the diplomatic pleasantries, official photo ops and press availabilities have concluded between the Pompeo delegation and the Imran Khan government, the hard work of the reset is about to begin. Much more needs to be done if the United States and Pakistan are to truly start anew.